The beholder DS2 is the upgraded version of DS1. 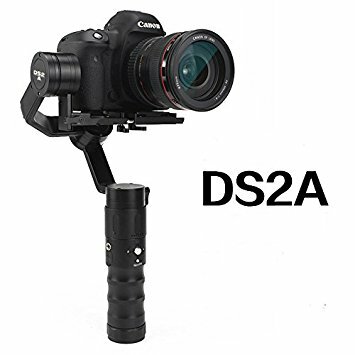 It is Widely used in theater quality video, capture micro-film, feature films, documentaries and other types of video works. It is Selecting motor encoder,360 °Unlimited Rotation. It has two versions :Beholder DS2A Tilt Arm Version and Beholder DS2R Common Version. *Build -in OLED screen display shows directly for power level and Current Mode. *1/4" screw hole is reserved for both sides. *Support wired or wireless remote control. *Can be used last for over 8 hours. *Small size ,easy to carry. BeStableCam HORIZON HG3 360 Degree..
BGNING Camera Lens Adapter Ring..
Metal Robot Chassis Track Arduino..
F00214-5 1X 450 Gear Set,TREX..
Flytec Navi T23 Brushless Double..
Eaglet-85 85MM Carbon Fiber DIY..
F19349 UDI U829-21 Camera Box of..